Sega has been many things over their long tenure as one of the most prominent and diverse game developers, and they can be honored to call themselves one of the “Big Four” developers in beat-em-ups, the less recognized brother of fighting games. Technos invented the genre with Renegade and Double Dragon, Capcom refined it with Final Fight, and Konami made the four-player format famous with Teenage Mutant Ninja Turtles. 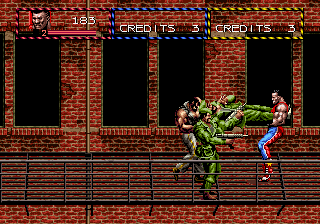 Sega’s biggest contribution to the fold was making beat-em-ups popular on home consoles with Streets of Rage, which was clearly inspired by Final Fight but ran on its own brand of urban destruction. Before that, Sega’s barbarian beater Golden Axe brought them much popularity in the arcades, alongside lesser known such titles like Alien Storm and Dynamite Dux. 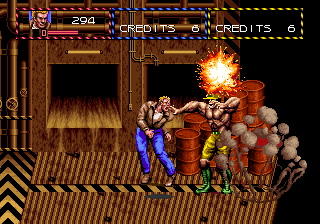 They never made a Streets of Rage specifically for the arcade, but they did have a modern-themed beat-em-up in the form of D.D. 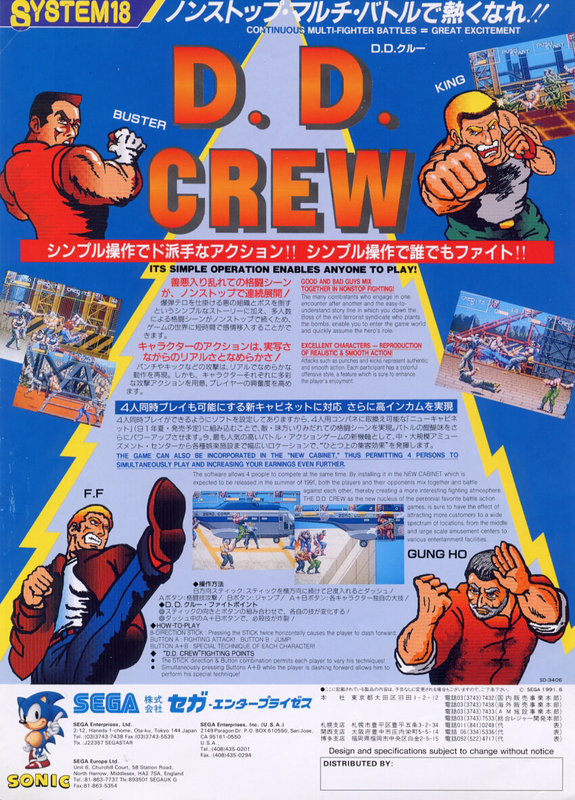 Crew, a game that almost no one has ever heard about due to being overshadowed by almost everything else Sega made in this genre. The title is derived from the Japanese phrase “don don kuru” in Japanese, which means “coming rapidly”, referring to rate in which the enemies flood the screen. It starts out promising enough, though. Some dude in a leather jacket (possibly a police officer) simply named F.F. receives a call from an insane pimp in an orange suit who tells him “YOU GOTTA BOMB IN YO PARK!” Cut then to a series of explosions in a park and the action begins. That’s the entire intro, and it’s brilliant as it is cheesy. Too bad it’s all down south from this point out! Before the intro, you get your pick of characters, all of whom seem to be modeled after actual fighters or action heroes: The aforementioned F.F. who vaguely resembles Jean-Claude Van Damme, kung-fu master Gung Ho as the requisite old guy (and possibly a reference to Shaw Brothers), King as the obligatory Ahnuld ripoff, and the uncomfortably Mike Tyson-esque Buster. The first two mentioned are the speedier characters, while the latter two eschew some mobility for power. It’s too bad that none are particularly interesting to play, maybe except for Gung Ho whose running animation has to be believed by observation. You only have an attack and jump button, and every character’s attacks seem somewhat short-ranged and awkward. Their strikes are somewhat random, though you’ll always do a semi-powerful low attack if you hold down while attacking. If you smack enemies three or four times, they double over and can be thrown by pressing both buttons together. 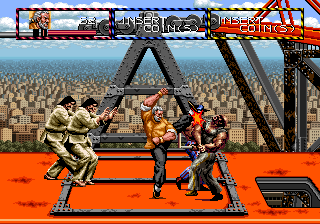 They can even be picked up if they’re on the ground and be tossed at other enemies a la River City Ransom. You can even dash, but you must press both buttons together to pull off a dash attack, which will actually cause you damage if you attempt it too close. There certainly isn’t much here for move variety, which could be forgiven if attacks didn’t feel so sluggish. You can only hit one enemy at a time even if two or more enemies are standing right next to each other. 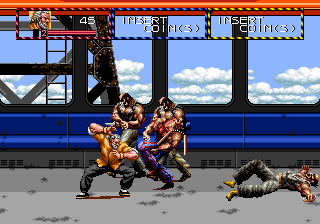 Speaking of the enemies, there are literally only five mook sprites for the entire game: Grinning bearded bald musclemen holding knives while maintaining a pose, goofy top-hat punks with segmented rods, fat guys in stripes, karate dudes with mullets and mustaches, and armed Saddam Hussein ripoffs who never actually fire their guns. 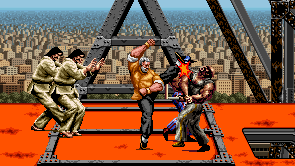 Merely fighting these dudes over and over makes nearly every stage un-fun to play. The most dreadful level is the fourth, which is a slow descent down scaffolds on the side of a red brick building. Not only does the terrain here get monotonous, but it really hammers home the painful lack of enemy variety. The game just floods you with the same four enemy types over and over for about fifteen minutes until you finally reach the bottom, where the boss is a fruity breakdancer who spins repeatedly and can only be hit about once every ten seconds. He is insanely cheap and trying to beat him makes the blighted stage feel even longer. The bosses add some thankful variety over the tiresome enemy parade, but they’re all supreme quarter-munchers who kill you in two hits and effortlessly avoid your attacks. Still, they’re somewhat interesting, if not just for several of them looking akin to actual people. Your first boss resembles Cheech Marin with twin sticks who tells you “You’re in for some roughin’ man!” The second baddie is the obligatory shameless Bruce Lee ripoff, while the third is a blonde babe (possibly Cynthia Rothrock) who’s hard to hit and swings around a spiked ball-and-chain. After the infuriating breakdancer, there’s a massive muscleman who tosses barrels and repeatedly charges you and the evil pimp from the intro who unfairly bombards you with rockets and machine gun fire. When you’ve beaten this rabble, the final boss, a yakuza chief who attacks you with swords and looks a tad like Takeshi Kitano, is incredibly easy. He’ll still do some good damage, but he’s much easier to hit than any other boss in the game and can be whomped after using two, three lives tops. Then again, an anticlimax isn’t so bad when every other boss is a jerk. If there’s any upside to D.D. Crew, its unique graphical style keeps it from complete crap status. Running on System-18 technology (same as Shadow Dancer and Alien Storm), a somewhat photorealistic feel is given to backgrounds and characters. 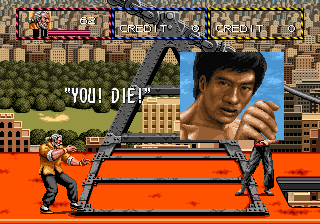 The above-mentioned first boss fight commences on some sort of large platform rigged to a carnival swing, which shows off all the fancy graphical effects that the Sega System 18 board can churn out. Drab fourth level aside, the rest of the backgrounds are at least reasonably detailed. The second level warrant particular mention, taking place on a tram car and giving a nice view of the background cityscape. On the flip side, he normally adept sound team of Sega was taking an off day, as the music is laughably bad ’90s rap mixes that get repetitive after a while. 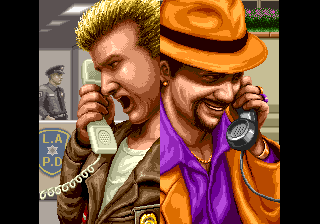 Their only amusing factor is their use of voice samples, such as the intro clip which boldly shouts out “SHUT UP ALREADY!” It’s another reason why the ten-second intro is the best part and why the rest of the game is sludge in comparison. D.D. Crew has abysmal control response, even less enemy variety than nearly any other beat-em-up, and gets too long and drawn-out by the fourth level. Its only redeeming gameplay feature is, as with any other beat-em-up, its multiplayer support. 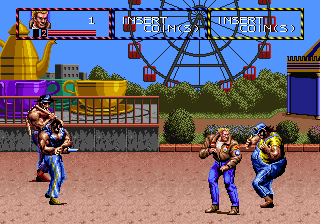 Some versions of the game only allow two players, while others permit three and still others bring in four. With four-player support, D.D. Crew at least turns out a slightly more entertaining game than Konami’s similar Crime Fighters, though that’s certainly damnation via faint praise. Why play this when you could go for other four-player venues like Vendetta, the much-improved sequel to Crime Fighters, Taito’s ridiculous Growl, or even Sega’s own Golden Axe: The Revenge of Death Adder? At its base, D.D. Crew is just blithely mediocre, and there’s not much reason to play it when many other brawlers (even amongst Sega’s catalogue!) offer so much more than just eye candy with random park bombs.